In law school, as part of a Gender and Women’s Studies class, I had to attend a two-hour discussion section on abortion. I was one out of twenty students that didn’t wholeheartedly support abortion. I walked into the classroom with a decided goal to remain silent and keep my head down. That lasted about two minutes and one “clump of cells” comment. Before I knew it, I had explained the scientific reality of fetal development, the unfortunate reality of women who regret their abortions, and the pro-life feminist perspective. I discussed how insulting it was to be told I needed the right to abortion to be equal, that I didn’t believe we should accept a society that told women and girls that there was a problem with the facets of the female experience that differed from the wombless male default. The class period was coming to an end and I felt rather proud of myself for standing up to a room full of law students and an accomplished professor, for engaging in thoughtful discussion and hopefully making some people at least think about the ramifications of abortion. As I prepared to walk out in what I was deeming the closest I’d come to a “mic drop moment,” a pro-choice female class-mate ended the class by saying: “This was a nice discussion and of course we can talk about pro-life stuff, but there’s such a thing as the separation of church and state, and your religion simply doesn’t get to control laws.” Then I sat shocked as several other students in the class nodded along, and the woman who made the statement rolled her eyes. 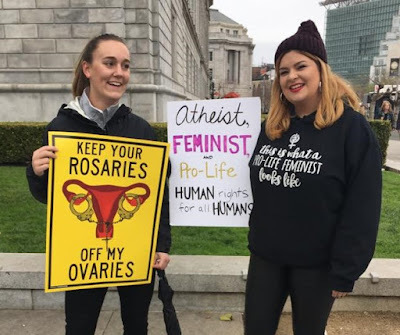 I would understand this comment directed toward those praying the rosary outside an abortion clinic, or that token male who appears at most pro-life demonstrations with a megaphone shouting that abortion will send you to hell—but why was she saying it to me? This last Saturday, January 21st, I attended the Walk for Life in San Francisco. As I began walking, representing a secular organization, the first person we came in contact with was a woman handing out a brochure entitled “How to Find God.” She walked past us and attempted to hand the brochure to a group of women on the side holding a sign that stated: “My Body, My Choice.” I saw them all share a knowing glance and collectively roll their eyes. What struck me was I had seen that glance, I had seen that eye roll before. It was the same one those law students gave each other in my Gender and Women’s Studies class. I realized in these women’s eyes and my classmates’ eyes, it didn’t matter what scientific, moral or feminist arguments I came up with; I was one and the same with this woman handing out the religious brochure, with those who pray outside the abortion center, and with anyone who shouts about abortion sending you to hell. Throughout the day, I saw countless signs and heard many speakers spread the exact message that girl thought I was spreading back in law school: “Abortion is wrong because God says so.” We have a long way to go but the secular message is the future of the pro life movement and we have to work to dispel the notion that a critique of abortion can only come from religion, so that the logic of the pro-life position can be heard. We’ve got to all start using the best card we have: Abortion is wrong, not because God says so, not because the Bible says so, but because it ends a human life.